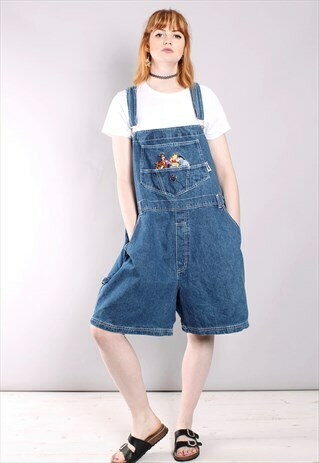 This Salvaged garment is a 100% vintage 1990s Disney blue denim dungaree overall shorts with clasp fastenings, mini pockets on top and pockets on sides. Embroidered Winnie the Pooh characters on front pocket. CONDITION - Excellent vintage condition, may be some natural signs of wear due to age. No missing button, just wasn't done up properly in photo! SIZE - Model is a size 8 and 5'7". Garment size L, fits up to UK 24 dependent on fit desired. Waist 42" 107cm / Length (front top to bottom) 29" 74cm / Hips 50" 127cm. DELIVERY - Next day delivery available Monday-Thursday on orders made before 1pm. Orders made on Friday will be posted on Monday. Model is a size 8 and 5'7". Garment size L, fits up to UK 24 dependent on fit desired. Waist 42" 107cm / Length (front top to bottom) 29" 74cm / Hips 50" 127cm.